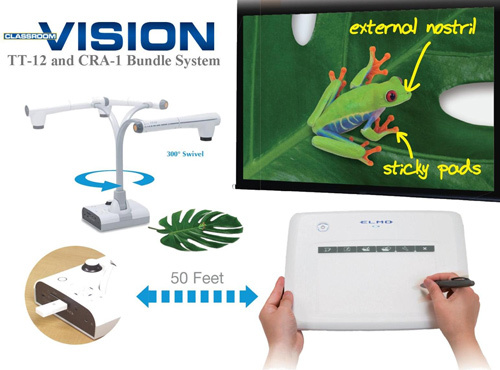 The CRV-24 + CRA-1 Bundle is a bundle system of the CRV-24 Student Response System and CRA-1 Wireless Tablet all for a great price. 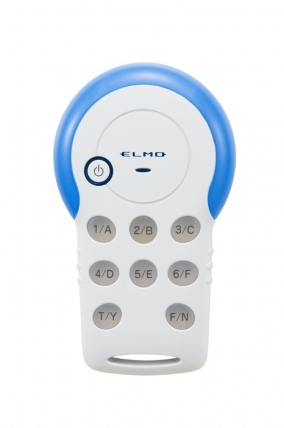 ELMO’s CRV-24 (Student Response System) is easy to set up and use. The entire system is managed via a wireless adapter (dongle) that inserts into any computer for “plug & play” use. The system also works with nearly all types of content, including PDF, Power Point, Word, online content and learning programs. 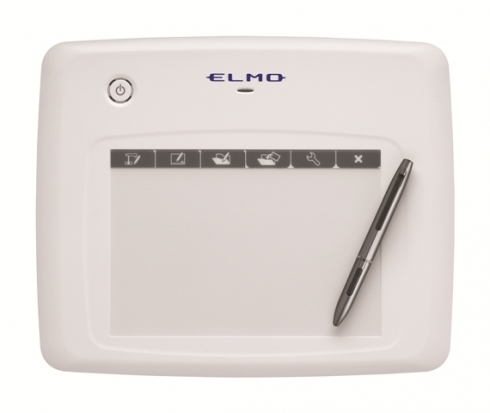 ELMO’s CRA-1 wireless tablet allows you to walk around the classroom to take a closer look at what the students are doing and engage them easily. You don’t need to be stuck in front of the class all the time anymore! Use it with the ELMO document camera and annotate on live images, record your lesson instantly and share it with the whole class. L4 11/2" x W2 17/32" x H1 1/32"
L2 17/32" x W7/8" x H13/32"
L16 47/64" x W14 9/16" x H6 1/2"
The ELMO SRS(Student Response System) aids teachers by recording student responses into the ImageMate Accent for SRS software, so that teachers can review students’ performance and understanding of the material, as well as analyze the results using XLS, CSV, and XML formats. Students Respond Students use the clickers to key in their answers, which are recorded in the software database. 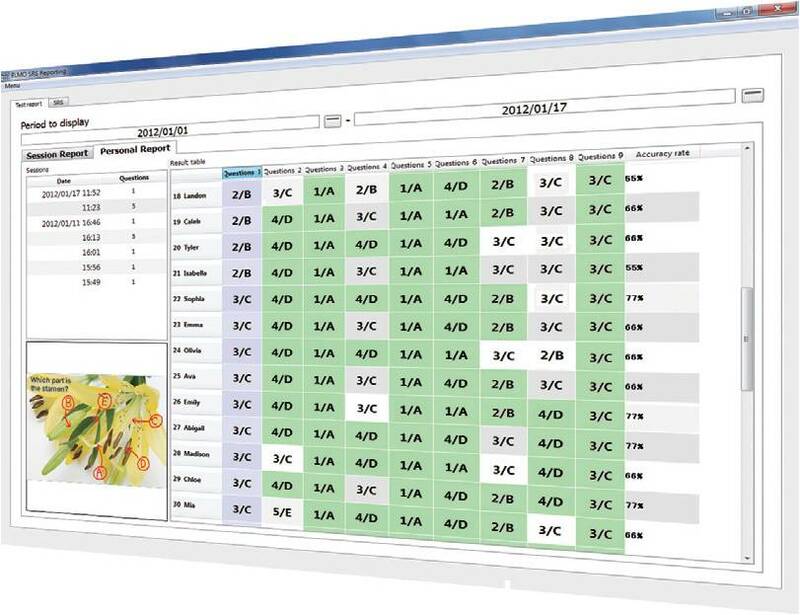 Results Are Tabulated Student responses are instantly tabulated and displayed in bar graphs or pie charts, allowing teachers to assess the performance of an entire class. Measure student comprehension in real time. Enhance student participation and motivation to learn. Simple teacher-friendly control panel. 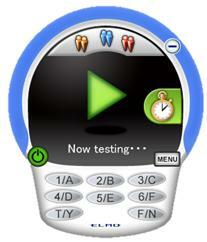 Ask a question, click on the arrow button in the middle, and the quiz time begins. Because the control panel looks just like the clickers that students have in their hands, they can easily follow the teacher's instructions. 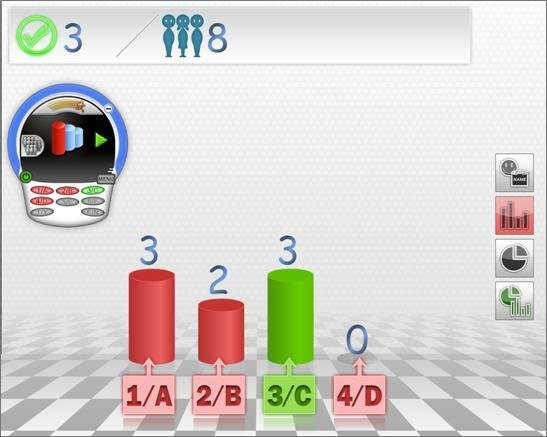 Teachers can poll students at any time during class to assess progress.After collecting answers, results can be displayed instantly in bar graph form. 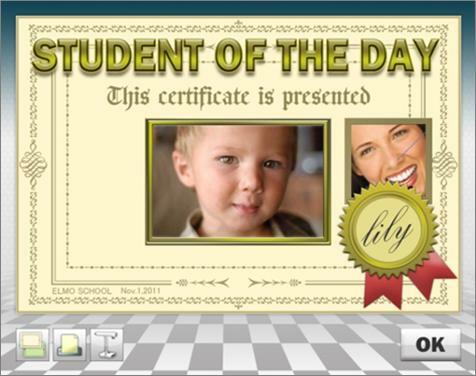 This allows teachers to review student understanding and manage the class. Based on responses shown up, teachers can determine whether they need to review, re-teach or proceed with the remainder of lesson. Reward illustrations appear on-screen, quizzes can be timed to create a sense of urgency, and friendly competition is inspired by showing a list of the five quickest responding students. Divide students into different groups and let the groups compete with each other. The result will be shown either by group or by individual student. A surprising prize will be shown on the screen when all of the students in the group make a correct answer. Also, the top 5 fastest responding students will be rewarded. The software will be updated continuously and new exciting features will be added. 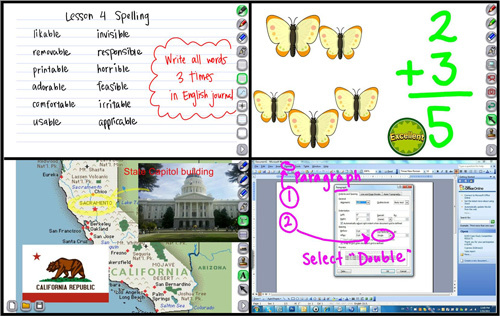 Quiz questions that have been asked are automatically captured and saved to the software, so teachers can review the questions for future lesson planning. Because of the way it analyzes class results, the software is ideal for recognizing what learning concepts are not yet fully understood by a class. Individual student achievement can be reviewed and analyzed via the software, which helps teachers manage the grades of individual students and monitor their progress. 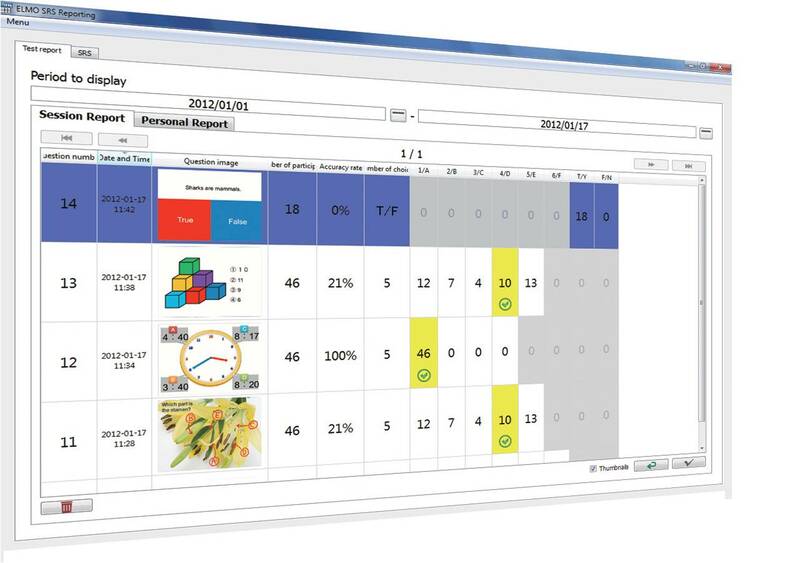 Note: Additionally, with the optional iRespond software, teachers can perform advanced analysis and grade management. 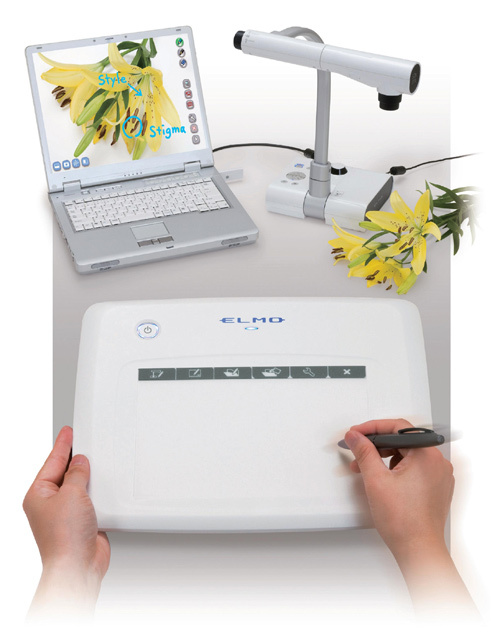 Adding an ELMO document camera allows teachers to use any kind of teaching material, including textbooks, worksheets, and real objects along with computer software. With the CRA-1 wireless tablet, teachers can move around the classroom and interact with students. Also, teachers can conduct lessons more flexibly and even write pop quizzes by hand with little or no preparation. To help teachers get their points across, whiteboard mode offers a choice of six lesson-reinforcing backgrounds- including musical score, horizontal lines, and graph paper. Teachers can write and draw on those whiteborads from distance while walking around the classroom. 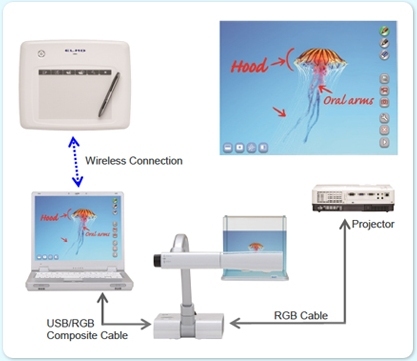 Furthermore, wireless control function allows you to use any educational materials stored in your computer such as power point slide, pdf and word files etc. Online educational materials are not exception. After activating Image Mate Accent software, all you have to do is to plug the wireless adaptor(USB dongle) to the computer USB host. It takes less than one minute to start using the ELMO wireless tablet! It doesn't bothre your limited teaching time. 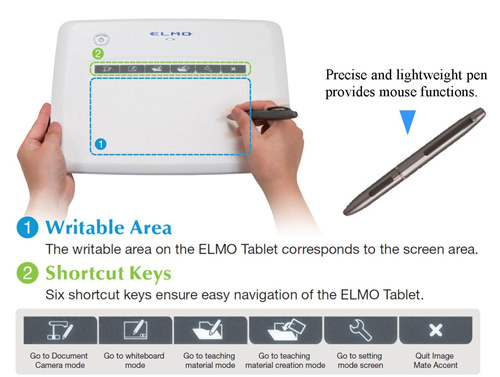 Six shortcut keys ensure easy navigation of the ELMO Tablet, even for first-time users. The ELMO tablet pen makes writing smooth and easy. 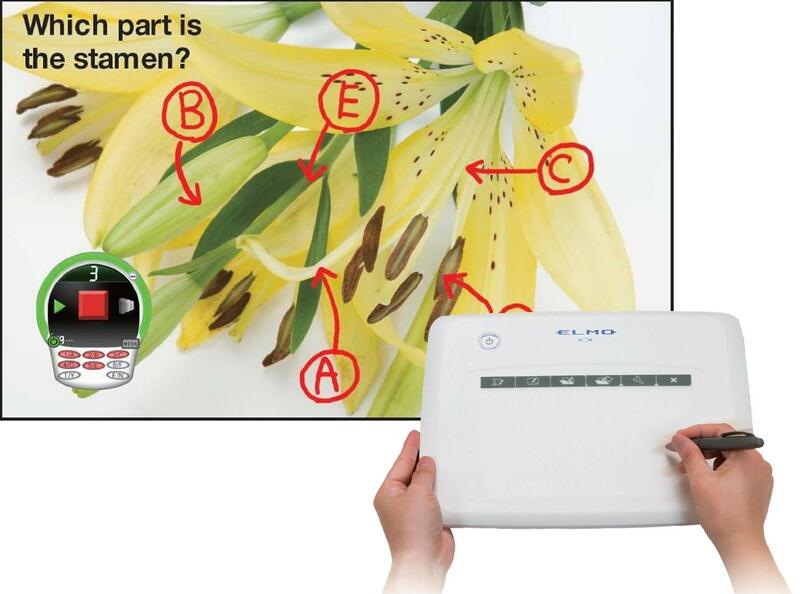 Teachers can use the pen to annotate online educational materials, annotate images captured by an ELMO document camera, or enhance their own digital teaching materials. For added emphasis, adjusting the amount of pressure applied to the pen when writing changes the thickness of the lines. Teachers can annotate on live images from an ELMO document camera to deliver more detailed instruction and achieve greater student engagement. The ELMO Tablet partners effortlessly with an ELMO document camera for dynamic, smooth-flowing lessons. Teachers can annotate live images from an ELMO document camera to deliver more detailed instruction and achieve greater student engagement. The ELMO Tablet partners effortlessly with an ELMO document camera for dynamic, smooth-flowing lessons. 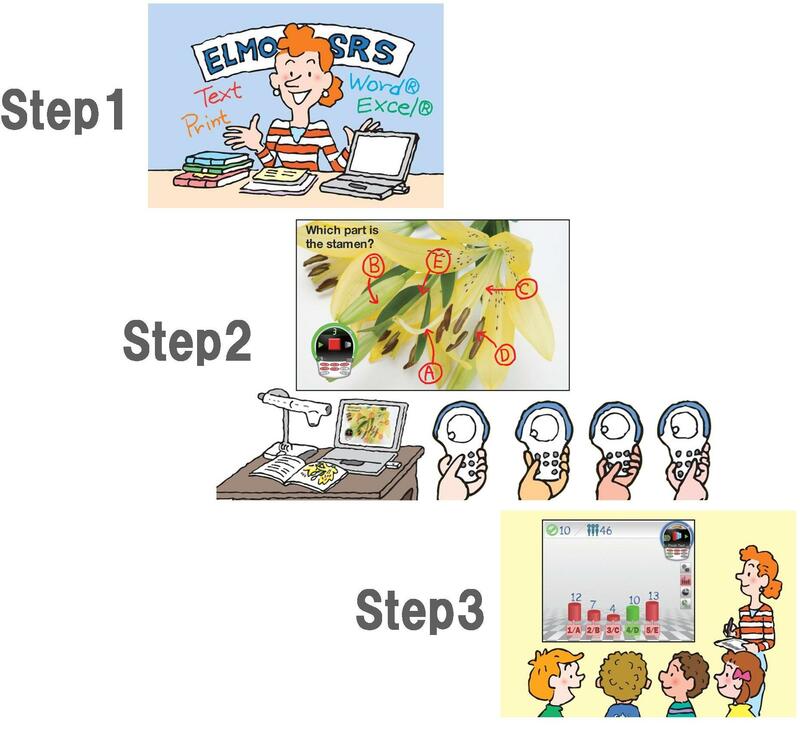 In addition, applying mask, highlight, and split screen functions to captured images focuses student attention and brings interactive learning into the picture. Partner the TT-12iD with the ELMO CRA-1 Tablet for dynamic smooth- owing lessons. Teachers can annotate on live images captured by the TT-12iD while the image is displayed on a large screen. This empowers teachers with the tools to deliver detailed instructions and achieve greater student engagement. 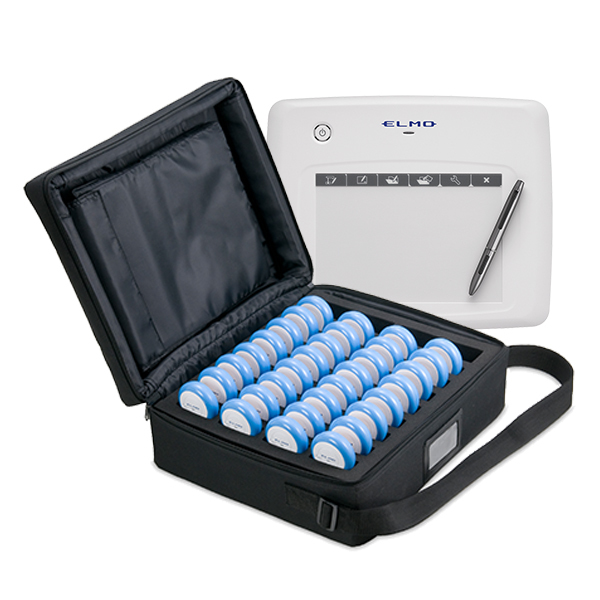 Because the ELMO Tablet is wireless and can remotely control the TT-12iD, teachers can move freely around the classroom (within 50 feet of the TT-12iD), making it possible to interact with the entire class and individual students. 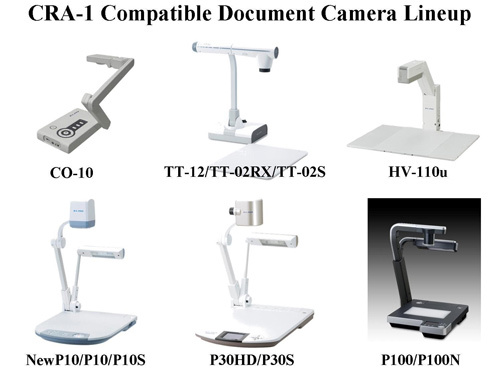 The TT-12iD can capture images from all directions, thanks to an adjustable camera arm that can be swiveled to broaden the scope of classroom presentations. The solidly constructed camera arm holds its position and is easily operated for both left- and right-handed users.